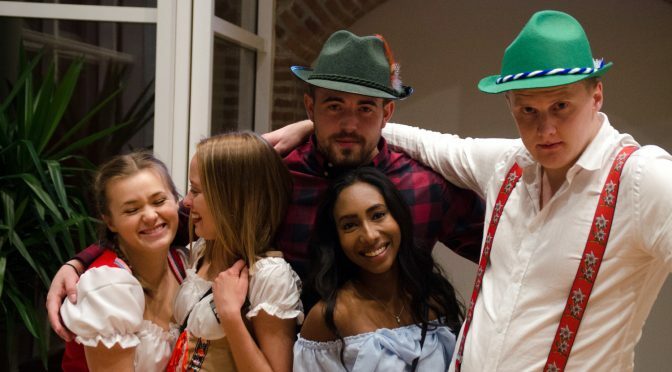 Friday, HiMolde students celebrated the renowned Bavarian folk festival, Oktoberfest. Well, not exactly at the same time and the same place as the original one, but it turned out to be an enjoyable and quite realistic duplication of the one that takes places in Munich, Germany. Oktoberfest (or as the Germans also call it ‘Wiesn’ after the location ‘Theresienwiese’, or Therese Field) is a more than 200-year old festival in Munich, originates from 1810, when the crown prince Ludwig (later King Ludwig I, ruler of Bavaria) held and celebrated his marriage with Princess Therese of Saxe-Hildburghausen with a horse race on the field named after the later queen. Nowadays, there is no horse race anymore, but nevertheless Oktoberfest is one of the biggest folk festival in the world with usually around 60 million visitors from Germany and all over the world. Talking about traditions, it has just become the same in HiMolde, namely to celebrate Oktoberfest at the uni’s student bar ‘Smuget’. That might be one of the reasons why this event actually seemed authentic, especially for those who haven’t visited the original festival yet. The long dining tables were covered with tablecloths that represented the Bavarian flag with blue and white rhombuses. More noticeably many participants took the liberty and chance to dress in more or less traditional Bavarian folk costume. We could see ‘hunting hats’, suspenders, shorts, chequered shirts, stockings, on the gentlemen, and ‘Dirndl dresses’ on the ladies. ‘Lederhosen’, or leather trousers, was the only thing that was missing or particularly rare. By the end of the night, the ‘partycipants’ could acknowledge that another themed-party became a success, after all everyone enjoyed their time in good company and fun circumstances.